Kanagawa and Fujix Tire make the highest quality filament silk thread available worldwide. The thread construction is an even 3 ply twisted continuous filament silk thread. It is colofast and it has a high sheen. Although designed mainly for hand embroidery, needlepoint, hand stitching, tayloring, and for quilting, this silk thread is also great for beading, half-hitching, micro-macrame, Cavandoli knotting, and for making tassels. Personal note - I love this thread. It has a lovely feel and sheen. The filaments are sturdy and well plied. It does well with manipulation unlike a lot of other silk. The color range is great! 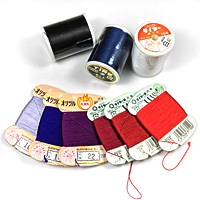 About spools - According to the manufacturer the silk thread used on cards and spools is the same exact thread, but there are a few differences: No creases on the thread on spools, whereas the silk on cards has fold marks. The thread on the spools feels just a tad thinner and smoother than the thread on the cards. It might be due to the spooling process compressing the thread. About colors - Color can vary between dye lots. While every attempt was made to reproduce thread colors accurately, colors on your monitor may not precisely match actual thread colors.